The main building stretches over three levels connected by a marvelous green patio. On the lower level, the reception area is part of a tasteful living-room, furnished with handsome traditional pieces. In the upper level a big fire place sweetens the chilly spring and fall evenings. In between, next to the small interior bar for drinks and refreshments, wide balcony doors fold to lead to the exterior spaces which are embraced by huge red flowering bougainvilleas. 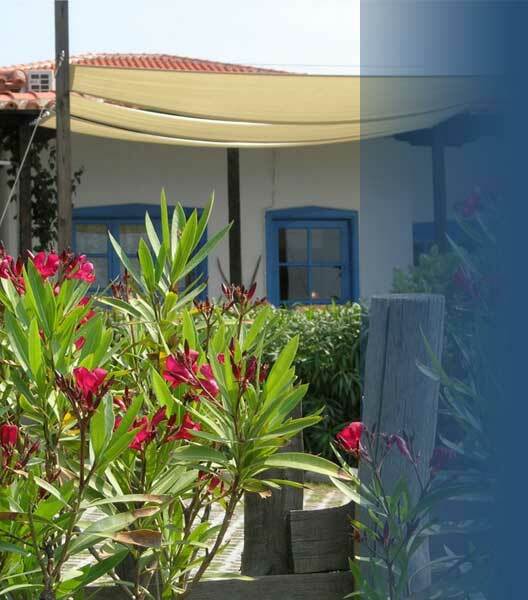 Here on the two terrasses overlooking the sea the owners of Skites run a restaurant offering exquisite Greek home-cooked meals, renowned all over Chalkidiki for their quality and taste. The restaurant is open for lunch as well as for dinner.